Stands at Excursions™ 2017 are now available at a special early bird discounted price until 30th June 2016. Delivering more than 40 years of inspiration to group travel organisers and itinerary planners, Excursions™ is notably the longest established national group travel trade show. The 'new look' 2017 show will be revitalised with a fresh shell scheme, carpet layout and themed areas. 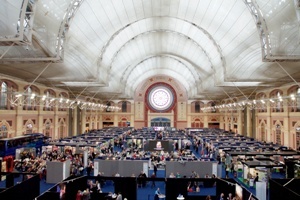 Demand for space is expected to be high at this dynamic, free entry exhibition, which will be held on Saturday, 28th January 2017, at Alexandra Palace, North London (10.30am - 4pm). It will bring together some 300 exhibitors from the UK, Ireland and mainland Europe and more than 1,200 quality group buyers and inbound/outbound itinerary planners, all meeting under one roof. Attractions, destinations, accommodation providers and tour operators will be showcasing their latest group offer providing fresh, inspirational ideas for day trips, short breaks and longer holidays in the UK and further afield. New themed sections will be devoted to Christmas Markets and Food and Drink, while the geographical areas for which the exhibition is renowned, will be retained. For the second year in succession, show organisers Tourism South East welcome Group Leisure magazine as the main media partner, while London & Partners will also be continuing their support for the show. Joining the sales team will be Adrian Gates representing the East and South West of England as well as Ireland and overseas countries, and Karen Roebuck who will be working with new exhibitors in other parts of the UK. Looking forward to Excursions™ 2017 show organiser and Travel Trade Marketing Manager at Tourism South East Joanne Channon said; "Following the success of our 2016 show, the Excursions™ team will be working hard behind the scenes once again to deliver a vibrant exhibition next year. We are also looking forward to developing an even stronger relationship with our show partners and welcoming everyone back in January." Comments from delighted exhibitors at the 2016 show endorse its ongoing success. Confirming they will be booking a stand for 2017, Martin Slater from Greatdays Travel Group said; "Excursions™ continues to be the best one day show to exhibit at; it's held at the right time of the year and, more importantly, on a Saturday when group organisers, many of whom are semi-retired, are able to come down to the show." Excursions 2016 was an invaluable start to the year for Tim Fleming from the River Cruise Line and Diamond Holiday Group; "With more new group organisers attending and our regulars, it was a fantastic opportunity to further our existing relationships and nurture some new ones." Excursions is an "annual must do" for Diana Roberts from Visit Guildford who added; "The show is brilliantly organised by Tourism South East with strong communication from start to finish," while Ellen Walker from Brightwater Holidays said, "This is without doubt the premium group travel show". Early bird booking forms are now available online or please contact Joanne Channon at Tourism South East on , Tel: 023 8062 5472. Additional discounted rates are also offered to members of Tourism South East and London & Partners. Online visitor registration will open from mid-September at the show's website http://www.excursions2017.com. You can follow Excursions™ 2017 on Twitter @Excursionsshow for news and updates or visit the show's Facebook page at 'Excursions: Group Travel Trade Exhibition'. A video with highlights from the 2016 show can also be viewed on the website.